Create a relaxing haven for your guests with our Bali Gazebo and Jagram Luxury Chairs. Exaco has been importing and distributing high-quality European greenhouses and outdoor products for many years. We are excited to now offer our luxury line including a stunning hand-crafted Gazebo made of solid Bengkirai wood and fully furnished with cushioned benches, a coffee table, and pillows. Our hanging chairs are not only beautiful, but beckon visitor to cozy in to their cushions and swing in the breeze. Great for indoors and durable for outdoors. Place an order in the booth at the show and we'll give you free shipping in the continental U.S. Come visit us! 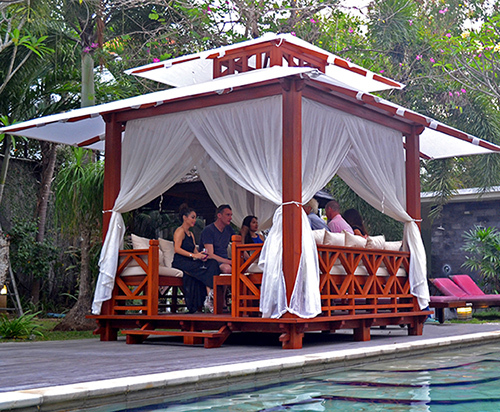 This beautiful and inviting gazebo is handcrafted in Bali of the highest quality Bangkirai wood. The elevated floor, mosquito netting and LED lighting create an intimate and comfortable setting for up to eight adults - or two people fully-reclined in utter bliss. Larger 13' x 13', 169 sq ft footprint (BG13) is also available by special order. Contemporary furniture developed by world-reknowned architects, engineers, and designers. Progressive design create attractive, comfortable, and durable leisure furniture with European flair. Exceptional materials meet the highest standards. Jagram uses only verified, high-quality and 100% FSC-certified Scandinavian timber. Each piece of Jagram furniture has been constructed thougtfully for visual appeal, durability, and ease of assembly. The hanging furniture is available in sets of stand/chair/cushion, or as separate components -- see below for details. The stands allow flexibility of placement, but each chair can be permanently installed from the ceiling, beam, or even a tree. The Wave Chair offers a distinct curve that pairs beautifully with the Optimist Stand and the classic ivory polyester material works well for indoor or outdoor use. The firm, durable cushion will provide support for years to come. Stand and chair supports 300 lbs. Purchase the Wave Chair or Optimist Stand separately or as a set. 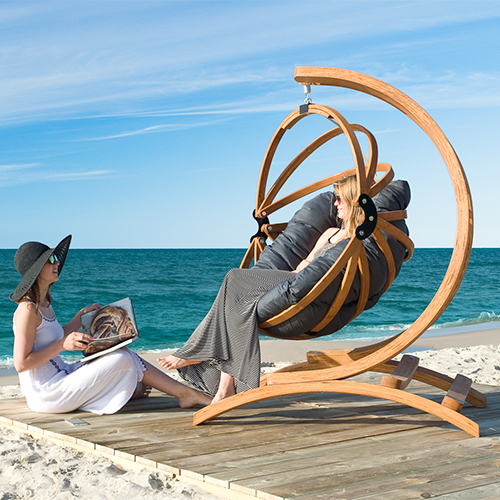 The signature ball style hanging chair beckons and does not disappoint. The Gaya basket chair comes with a soft, deep, fluffy cushion with your choice of fabric coverings. Perfect for getting cozy indoors with a book or lounging outdoors with a beverage. Available in 2 sizes: medium (holds 265 lbs) and large (330 lbs). Pairs well with Genoa (holds 265 lbs) or Spinnaker (330 lbs) stand. The Gaya Basket Chairs are available in 3 elegant types/colors of fabric - all are UV resistant and water repellent.